Rallycross whitewash: Spencer Sport’s Mirage RX Supercar was unbeaten at Silverstone. Pic Hal Ridge. 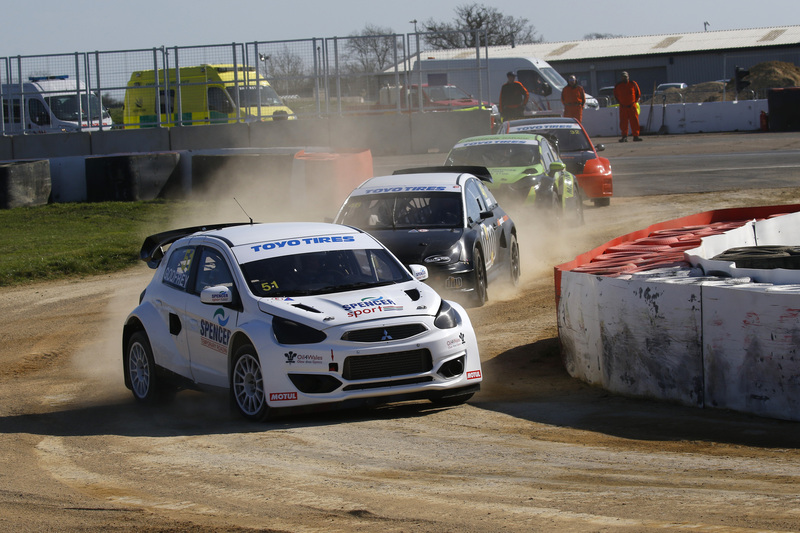 West Wales motorsports squad Spencer Sport has started the 2019 Toyo Tires British Rallycross Championship is style, with victory in the opening round of the season at Silverstone. Julian Godfrey, driving the Penrhiwllan-based team’s Mitsubishi Mirage RX Supercar, won all three Heats and the Final to clinch a dominant victory. Starting from the middle of the front row for the first Heat, Godfrey reacted well to the lights and using the superlative traction of the Mirage to his advantage, led the pack into the opening corner. It was an advantage he was never to lose and after four laps he went on to cross the line nearly two-seconds ahead of his closest rival, Derek Tohill in a Fiesta. Heat two saw a repeat of the first and again, Godfrey won the start and entered the first corner in the lead to score his second lights-to-flag victory of the day, again ahead of Tohill, but this time by a margin of 2.6 seconds. Off the line in Heat three, it didn’t look like Godfrey was going to make it three wins, but the Mirage’s combination of grip and acceleration meant that he was first through turn one and once ahead, the fate of the others was all but sealed. Having won all three of his heats and setting the fastest lap of the day in the process, Godfrey started the Supercar Final in pole position, next to Tohill in P2 and Steve Hill in a Mitsubishi Evo X in P3. Given the benefit of track position, combined with the start-line prowess of his Mitsubishi, Godfrey made the most of the situation and once again, headed the chasing pack into the first corner. After a small amount of defending in the opening stages, the Mirage driver quickly edged ahead and by the end of the sixth and final lap there was 2.5 seconds of daylight between him and Tohill. “To win all of the Heats and the Final is a perfect start to the season,” said Godfrey. “Not only that, there’s no damage whatsoever on the car, which is an unusual outcome in a sport as close as Rallycross. The second round of the Toyo Tires British Rallycross Championship takes place on Easter Monday (22nd April) at Lydden Hill in Kent. Spencer Sport’s 2019 British Rallycross Championship campaign is supported by: Spencer ECA, Motul, Oil 4 Wales, Speedline Corse, Hopkins Specialist Race Trailers, Nicky Grist Motorsports and Julian Godfrey Engineering.